Botany Bay CC is a rapidly developing and growing club located on the border of Middlesex and Hertfordshire between the towns of Enfield and Potters Bar. 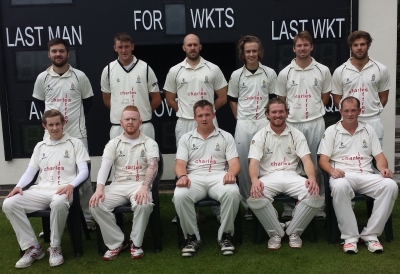 The Club has made great strides in recent seasons with our ex-1st XI (pictured) achieving no fewer than 6 back-to-back promotions in the last 7 years, including 4 as champions! We have a growing junior section which caters for boys and girls aged 8 through to 17 and we are actively looking to promote girls' cricket. Our juniors train on Monday evenings and play matches at Under 11, 13, 15 and 17 level against other local clubs during the school term. We are currently progressing an ambitious and exciting development plan which aims to grow the club, diversify our membership and ensure we are able to cater for players of all ages and abilities. The cricket club are always looking for new players at both senior and junior level, where we are actively looking to promote girls cricket. Whether you're an established player who's moved into the area, someone looking for a new challenge at a new club or if you're a complete beginner, we'd love to hear from you so please get in touch via the Contact Us' section of the website. Botany Bay CC is also home to many other sports and social clubs, including its very own Petanque and Darts teams, Cuffley Rugby Club, a section for MG car enthusiasts and no fewer than 3 live music clubs. If any of these activities interest you, there is more information on their dedicated pages which can be accessed either by clicking the links above or selecting the 'Other Sections' tab at the top of the page.